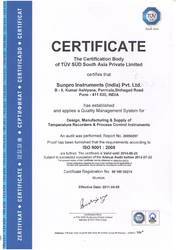 Sunpro Instruments (India) Pvt Ltd. is a professionally managed manufacturing & marketing firm for Industrial/Agricultural Electronic Process Control Instruments. Started in 2005, with three partners, we are a well-established name in the Technical & Techno Commercial field. To maintain a competitive edge in the global markets, we have constantly been upgrading our technology and our research and development department has been coming out with high quality products to meet the demands of our clients. Our commitment to excellence and quality has shown us the way to growth. Some of our significant customers are manufacturers of Blood Bank Refrigerator, Foundry Owners, Sugar Factories, Heat Treatment Machinery Manufacturers, Manufacturers of Agricultural Equipment, Meteorological Equipment Manufacturer and many more industrial applications. With our excellent offering we are one of the preferred choice amongst host of many other players in the industry. We have set up a platform where in the clients are constantly in touch with us, this helps to create client satisfaction and enable us to offer them with best of our services. Mapping and Validations at Sites. We are a well-known entity in the industry with the support of a huge client base all across the globe. We endeavor to understand the needs and wants of our clients and cater to their exacting requirements. Reputed customers are manufacturer of Blood Bank Refrigerator, Foundry, Sugar Factories, Heat Treatment People, Agriculture, Meteorology Application and many more Industries application. About 90% industries require our products for variety of applications. For us, quality is necessary not just to attract new customers but also to retain our high reputation in market. Our products are made of best quality materials available in the market. The products are checked at every level of production to ensure flawlessness and complete customer satisfaction. We set all the international standards of quality under stringent measures. We have an in-house manufacturing facility with State-of-the-art-infrastructure that incorporates regular monitoring of entire process by qualified technical personnel with adequate experience supplemented by modern logistics and technology. We are known for timely delivery, better services and competitive prices.